Don't slip climbing that ladder! 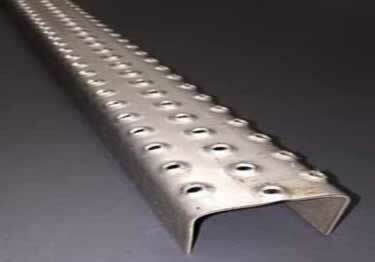 Anti-slip metal ladder rungs are designed with hundreds of perforated buttons for slip resistance in all directions. Great for industrial applications. The ladder rungs are a hand-over-hand friendly surface with moderate slip resistance. Extreme Condition Anti Slip Tape is comfortable enough to walk on in bare feet and strong enough to withstand harsh conditions. Protects tile edging providing a smooth transition to flooring at a lower elevation. 11 material/color combinations, 5 heights.